In only a few months, a small encampment of a few Lakota people dedicated to protecting the Missouri River from the Dakota Access Pipeline (DAPL) became the center of international attention, swelled to house up to 14,000 people at its peak in early December 2016, and was supported entirely by volunteers and countless donations of both money and goods. Many people from around the US and beyond traveled to North Dakota to support this fight for indigenous sovereignty, treaty rights, and environmental justice. Residents of the resistance camps existed within a capitalism-free zone, where nothing was for sale and everything from delicious meals to winter camping gear to expert medical care was available for free. 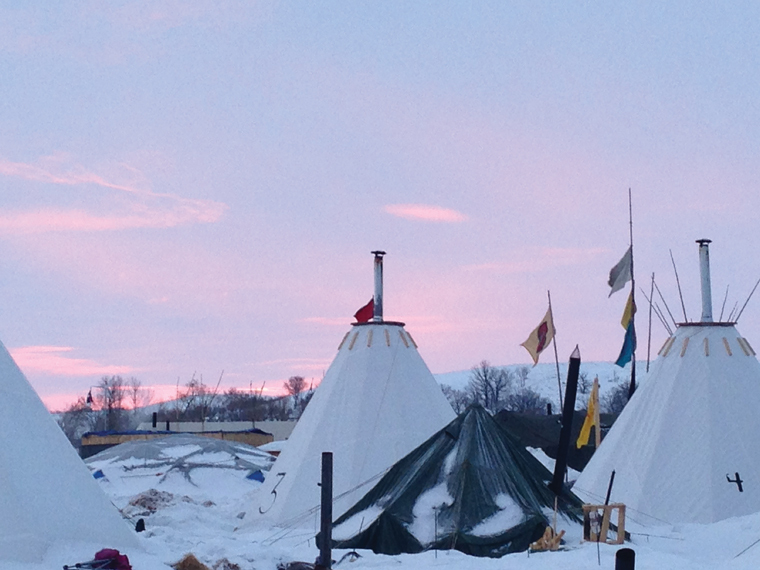 I first visited Standing Rock in early November 2016, and returned to spend five weeks in late December and January volunteering as a white ally to the indigenous “Water Protectors.” I spent my days splitting firewood, cooking meals, installing woodstoves, doing small carpentry projects, shoveling snow, sharpening chainsaws, doing dishes, and—on one rare occasion—livestreaming footage of police violence from the frontlines. 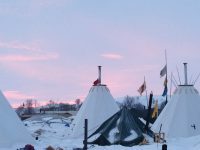 During both visits I lived at Oceti Sakowin Camp, the largest of the three Water Protector camps and the location closest to the front lines of the fight against the pipeline. Oceti Sakowin is made up of many smaller camps organized by tribal group and other themes, and I quickly found a home at Two Spirit Nation, a community of two-spirit, queer, and transgender Water Protectors from many different indigenous nations, as well as their non-indigenous allies. Most of my observations here will center on the deep winter weeks at Oceti Sakowin Camp, when nighttime temperatures regularly hit -25 degrees Fahrenheit, daytime temperatures sometimes failed to creep above zero, and cold winds whipped the open plain. The gift economies of direct action camps and festivals are easier to fathom in warm months, but during this period we all depended on the gift economy for our daily survival in a very real way. It’s notable that as of my departure in late January, not one person had died at the camps—compare this to large urban centers in cold states that see regular deaths from hypothermia among the houseless population under similar conditions. What did this gift economy provide for us? Housing. The winterized camp consisted of many army tents, wall tents, tipis, yurts, and a few tiny houses and RVs. Nearly all were heated with woodstoves, sometimes supplemented with small propane heaters. Most people slept on cots padded with several sleeping pads. You had to know someone at camp to get housing easily, but in an emergency you could spend one night in the warming tent maintained 24 hours a day near the Medic station. Arctic sleeping bags and endless piles of blankets were readily available for free if you hadn’t been able to bring your own. Residents in each structure took turns stoking the woodstove throughout the night. Food. Some camps had their own kitchens that would cook two or three meals a day, but there were also several public kitchens in the camp that would feed anyone who walked in their doors looking for food. All the kitchens were staffed entirely by volunteers and stocked with donated ingredients. Meat is a staple of the Lakota diet, and I ate many meals of deer, buffalo, and elk meat donated by local hunters and ranchers. Sometimes we’d get a chance to eat Indian Frybread Tacos and other local specialties. At Two Spirit Nation, we had two sizable tents full of canned goods, granola bars, butter and cheese, pasta and crackers, tea and hot cocoa, meat and fish, and endless boxes of winter squash and root vegetables. Much of it was from organic farmers from Maine to Oregon, who had donated their extra crops to support the cause. Even in late January we still had enough food to feed our 15-person camp for another few months…or at least until the first real thaw, when all the frozen meat and produce would go bad. Water. When it never gets above freezing, liquid water becomes a commodity. A heated water truck would make the rounds of camp most days, and small groups with access to a car would fill up five-gallon jugs offsite. The trick was keeping them unfrozen, so we usually kept them in the living spaces, which we heated around the clock with woodstoves. Melted snow was used only for dishwater, since persistent rumors circulated about harmful chemicals being sprayed in the atmosphere over our camps (as of this writing, there is no reliable scientific evidence to support this). Sanitation. Oceti Sakowin Camp boasted two composting toilet tents. Each large army tent contained 15 stalls, with two attendants supervising them 24 hours a day. The attendants kept the tent heated with a woodstove, and changed the compost bags when the bucket in a stall got close to being full of sawdust, toilet paper, and human waste. One side of each tent was reserved for “Moon Stalls” where tampons, pads, and baby wipes were always available in each stall. The toilet system was one of the most organized parts of the camp, although exactly where our compost was going to go after it left camp in those nice biodegradable bags remained somewhat mysterious. Security and Fire Response. An indigenous security team equipped with two-way radios monitored the two gates of camp 24 hours a day, and did patrols around camp. A second Women’s Security team was formed in response to several assaults at the camp, and maintained a safe housing space for women and two-spirit people. Three or four times during my stay, we woke in the middle of the night to people yelling “FIRE!” and rushed to the scene of a blazing tipi or shack, probably set afire by poor woodstove management. While these fires were too far along for our small fire extinguishers to make a difference, there was usually a person in full firefighter gear present who could probably have rescued anyone stuck inside. While the victims of these fires generally lost everything, they could easily get a new set of winter clothes and a new arctic sleeping bag from the donations available in camp. Medical Care. The Medic Wellness Area boasted winterized yurts and tipis for doctors and street medics, herbalists, bodyworkers and acupuncturists, midwives, and mental health workers. All these services were available at no charge. A licensed doctor was usually on duty in the medical yurt, and there were free-for-the-taking stations for herbal tea, fire cider, basic medical supplies, hygiene items, and condoms. At the time when I departed, three healthy babies had been delivered at camp, and the medics had handled countless front-line injuries from rubber bullets, chemical weapons, concussion grenades, and water cannons. Fuel and Firewood. Firewood was consistently the most sought-after commodity in camp. Somehow regular deliveries of whole logs consistently showed up, and each camp would send a few people with a chainsaw and truck or sled to get wood for the day. The general rule was to cut enough wood for your camp, and then cut some more and leave it for people who didn’t have a chainsaw. We all split the wood back at camp, and took turns stocking all the heated structures for the day. Every Saturday a propane truck arrived and filled our empty canisters with fuel for cooking and heating. I suspect these deliveries were paid for out of larger donation funds administered by Oceti Sakowin Camp or the Standing Rock Sioux Tribe. Winter Gear. Endless bags of donated clothing and bedding arrived at Standing Rock during October, November, and December. Much of it was unsuitable for arctic conditions, but there was enough high-quality gear to outfit the winter crew of Water Protectors (about 600 people) several times over. Anyone could visit the donation tents at any time and take anything they wanted. Tools. Each smaller camp had an assortment of tools, and there was also a large construction building that would loan out any power tool you could think of as long as you left your ID with them as collateral. They provided everything from electric drills to ladders to chainsaws to a sewing machine. They also had 2x4s, particle board, and screws that you could ask for, and they’d give you what you needed if you could show them a sensible construction plan and materials list. Spiritual Leadership and Ceremony. There were a few heated gathering spaces of different sizes that hosted everything from daily prayer circles to a huge Christmas Eve dinner with traditional singing and drumming. There were also several sweat lodges that any indigenous spiritual leader could use for the traditional Lakota Inipi ceremony of prayer, healing, and purification. Use Your Imagination… The abundance of physical donations led to a lot of things being creatively repurposed. My buddy and I cut up donated sweatshirts to make crocheted rugs for the living spaces, and unraveled donated sweaters to produce yarn to knit extra-warm wool underwear. I pulled from the scrap pile outside the construction building to build shelves in our living space, and countless donated blankets were used to seal out the draught in winterized tipis. Whatever you needed, there was probably a way to make it with the tools and materials available at camp. The gift economy at Standing Rock manifested itself according to the principles of indigenous culture. The Lakota people name generosity and compassion as two of their core values, and I saw those values in action every day. Much of the system depended on each group taking just enough for their own short-term needs, and leaving the rest for others. At home my instinct is to stockpile what I need for my own survival (two years’ supply of dry firewood, etc. ), but that sort of strategy has its roots in the questionable idea that individual survival is possible without collective survival. In the capitalist economy of mainstream culture, it’s common for one household to thrive while an adjacent one is struggling to meet its basic needs. Houseless people freeze to death huddled next to spacious and luxuriously heated buildings inhabited by more “successful” folks. In contrast, at Standing Rock we defined success as our collective survival. Therefore we took just the firewood that we needed, checked on the elders every day, brought food and coffee from our kitchen to the compost toilet attendants, and helped anyone who asked us for assistance. This culture of abundance seemed logical and easy in a situation where our needs for survival were simple and a steady flow of money and donated goods was pouring in all the time. I couldn’t help but wonder what it would take to create a steady-state gift economy, which could exist without these flows from the outside capitalist world. When I finally left Standing Rock my friend and I stopped at a co-op food store in Minneapolis to obtain some much-dreamed-of fresh vegetables to munch on. It was such a shock to be asked to pay for food again. It made me wonder what it would take for our larger society to turn its ship around and set a course for a more generous and compassionate form of economy. It seems that these values arise in us spontaneously when a natural disaster hits and we are suddenly in a survival situation, such as Hurricane Katrina in New Orleans or Hurricane Sandy in New York City. The rest of the time, our whole economy depends on a me-first, get-ahead value system based on competition and survival of the fittest (or, in a rigged system like ours, the most privileged). When luxuries and conveniences become symbols of status, we tend to become self-serving. When people become passionate enough about collective survival, luxuries and conveniences lose their appeal. How can we help each other prioritize our collective well-being? How can we encourage ourselves to expand our definition of “the collective” to include the Lakota concept of “all my relations”: the four-leggeds, the winged ones, the stone people, the star people? When we listen to the prayers of indigenous people and orient our values in this ancient way, the path to a truly sustainable gift economy can unfold before us. For further reading on pre-colonization economic history and gift economy theory, see The Indigenous People’s History of the United States by Roxanne Dunbar-Ortiz and Sacred Economics by Charles Eisenstein. Murphy Robinson is a wilderness guide, hunting instructor, and founder of Mountainsong Expeditions in Vermont. She lives in a Tiny House on a community organic farm in the mountains. You can contact her through her website, www.mountainsongexpeditions.com. I loved this story. It is my dream to live and participate in a community exactly like the one you described. It felt like home, as I read it. Thank you.